Congratulations to Keene Ice! 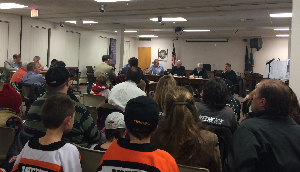 In a completely packed Keene City Council Chambers tonight (including out into the hallway), the Keene City Council finance and operations committee voted unanimously to approve the two agreements between the City of Keene and Keene Ice. The agreements now go to the full Keene City Council next Thursday for approval… but tonight was the big step to get this approval from the finance committee! Congrats! We as a city are now that much closer to having a year-round ice rink right here in Keene. This entry was posted in News and tagged Keene Ice on November 14, 2013 by Dan York.